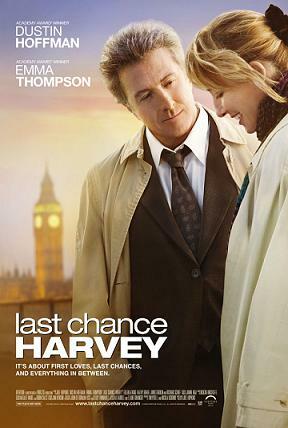 In Last Chance Harvey, written and directed by Joel Hopkins, Dustin Hoffman plays Harvey Shine, a divorced father from the U.S. to London to see his estranged daughter, Susan (Liane Balaban),get married. Not long after he gets fired from his job at a recording studio and his daughter choses to walk down the aisle with her stepfather, Brian (James Brolin), rather than him, he meets Kate (Emma Thompson) while sulking at an airport bar. Harvey and Kate gradually begin a romance with one another. Kathy Baker plays Jean, Harvey's ex-wife. 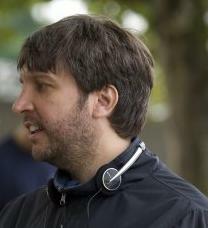 Joel Hopkins has priviously written and directed Jump Tomorrow. It was a real privilege to interview him together with Dustin Hoffman and Emma Thompson. Overture Films releases Last Chance Harvey on December 25th, 2008 (limited) and January 16th (nationwide). NYC MOVIE GURU: What do you think makes Last Chance Harvey stand out the most among other films today? DH: I think [America] has always been behind Europe when it comes to film. When I came here to study in the late 50’s, early 60’s, we went to see [films of] Truffaut, Antonioni, De Sica, Bergman and Fellini. I remember, back in those days, going to the Thalia on upper Broadway and I’d see so-called romances about middle-aged [people], [such as films with] Romy Schneider. So, maybe, we’re just finally getting around to what they were doing 40 years ago. ET: A lot of movies I see involve a lot of fast moving around and they’re often well done. However, I very rarely go see something that’s not like that, but has huge emotional movements. That, for me, is essential about filmmaking. The first movie I saw that made my heart lurch like that was Children of Paradise. NYC MOVIE GURU: What's the significance of your character, Kate, sharing the same name as the character you played in The Tall Guy? ET: My first movie was The Tall Guy, directed by Richard Curtis. I made that with Jeff Goldblum when I was 27. Joel [Hopkins] saw that when he was 10 or something. He then took that character, [also named Kate], a no-nonsense nurse, and, kind of, developed her. JH: This character was called Kate Lemmon and she was a wonderful, no-nonsense nurse, which made a big impression on me as a teenage boy. Whenever you watch a film, you always wonder what happens to [a particular character]. That was one of the, sort of, germs of the idea. I knew that Emma [Thompson] liked my first film, Jump Tomorrow, so I was determined to make use of that compliment and find some process to work together on. I’m living in New York and I’m also a Londoner, so I wanted to bring the two worlds together. I don’t think I ever told Dustin [Hoffman] this, but in the very first incarnation of this in my mind, Harvey was Japanese. I wrote a 10-page treatment with the characters Harvey and Kate and it was quite a sophisticated treatment. I showed that to Emma and she said, “Great”, but I, kind of, secretly wanted her to say, “Great. Let’s write it together.” and she didn’t. I then saw [her and Dustin Hoffman] together in Stranger Than Fiction and I, kind of, wanted to see more. I emailed Emma and asked, “What about Dustin?” and when I sat down to write the first draft, I clearly had these two [actors] in mind. NYC MOVIE GURU: What was it like working again with Dustin Hoffman after Stranger Than Fiction? ET: Dustin and I had such a good time and we did that thing that actors do which is [wondering], “Wouldn’t it be wonderful if we could work together again?” and it never happens. But it did [happen], unexpectedly, and through largely serendipitous routes. It felt like something meant because I don’t think that we could have played this when we were 20 years younger. I think it has everything to do with where we are in our lives now. It’s just one of those things that happened just at the right moment and that’s quite rare in our profession. I’m very grateful for it. DH: Emma and I had this, kind of, connection. The only way to describe it is when you meet someone at a party and the next day you say, “Jesus, I don’t know what it is. Well, what is it? I don’t know. It’s just something that happened.” That’s what happened and it still exists. NYC MOVIE GURU: How did your mother react when she saw Last Chance Harvey? JH: When I first showed her the film, she didn’t understand what the mother was doing that was so irritating. At one stage we didn’t have the little scene at the end where the mother has the future with the Polish neighbor. My mom was very adamant that that should go back in.